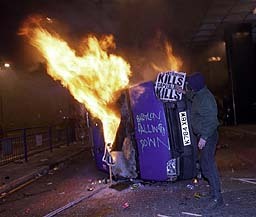 The last few days have seen London and other cities across the UK rocked by civil unrest. Seemingly coming straight out of the blue. A peaceful protest apparently hijacked appears to have gone viral. An anarchic spree of looting, spontaneously igniting in different parts of the country. A few days ago no one could have predicted all this. There still seems to be no root cause or clear reason. Disaffection must run far deeper in our society than anyone had really realised. Some news reports are already labelling these as “the consumer riots” – like something out of an old 2000AD comic. The masses are uniting. Taking flat screen TVs and iphones. The appliance of defiance. Demanding commodities and modern conveniences as their right. Each night I’ve listened as more police sirens than usual rise and fade beyond my windows. I’ve no idea why this has all started or what it is all about, but it is perhaps a reminder of one thing if nothing else: – how society can change direction on a pinhead. “7:30pm … There were more people than usual at the bus stop and a steady exodus of feet were heading east from Euston to Kings Cross. Fire engine after fire engine, and ambulance after ambulance, were heading with sirens blaring in the opposite direction. I was stood waiting for a bus, leaning against a lamp post, but it soon became clear that no traffic was coming east. A police van belted past stuffed full of black-armoured riot police with an iron grill pulled down over its windscreen. That was the trigger. I'd never seen a riot before. My curiosity was piqued. standing in the yard of Euston Fire Station. Anti-capitalist demonstrators on the crossroads were taunting the police. Further up they'd stopped the traffic. An acrid smell of burning was filling the air. They’d managed to overturn a police van and set it alight, but it had swiftly been put out. Very little was happening now. Small scuffles were occurring on the crossroads as it became the frontline for a moment before fading again. At one point people broke into a panicked run of retreat. My heart was racing but I figured it was best to keep off the road in the fire station forecourt. Be passive rather than reactive. Half-hearted anarchists were wandering all around, mobile-phones pressed to their ears, a few with tatty paperback novels in their back pockets. 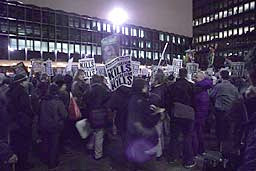 A small enclave of protesters with drums beating had been encircled and held in the grounds of Euston Station itself. A bloke sitting up on top of one of the stone fence pillars of the fire station said he could see protesters being "processed out" of the area by form-filling policemen "one by one." After about an hour of getting cold and bored I decided to start walking. Wandering back up towards Kings Cross. Ordinary people, suits and other commuters, were all mixed up with police and protesters. Suddenly there came a band of withdrawing riot cops on either side of the street, all chanting "Full Metal Jacket" style. 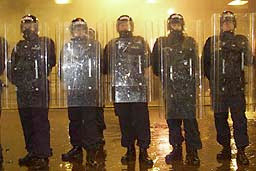 All helmets, jet-black body armour, shields and batons. Further on, as I drew nearer to Saint Pancras Station, I saw it break loose ahead. A teenage kid in combats and a black balaclava smashed a bottle on the pavement. The helicopter slowly moved back in. I ducked up the passage into the railway station and came back out onto the forecourt and went over to look down from the parapet, other people were already there doing the same. Below the anarchists were in the street. Thumping and throwing over litter bins. Rubbish was being strewn everywhere in the road. A very old man passing by stepped out from the kerb and carefully placed an empty paint pot from the spilt litter in the middle of the road, he then went back to the pavement again waving his fist in the air, his action rousing an amused cheer from those already “reclaiming the street”. Suddenly riot police ran in from both pavements and a confrontation began. The kid in the balaclava picked up the beacon broken off a pedestrian crossing and threw it at the wall of riot police. It slammed straight into the line of plastic shields at chest height. The anarchists were backing up towards Kings Cross. Two policemen below started hitting and pushing an ordinary passer-by on a bicycle. But then a whole troop of riot police came charging up the Saint Pancras approach ramp and violently started pulling people back from the parapet, ordering everyone either: "Down the steps!" (i.e. - into the riot itself), "Or into the Station!" (out of the riot). Even though the people on the parapet were all innocent bystanders caught in the middle, the police were all pumped up aggression. Of the choice given I quickly chose the latter option and dashed into the railway station, stopping just inside the threshold with a young woman. Looking back we saw a riot cop in a luminous jacket with a plastic shield stood only a few feet away, he levelled his baton with its tip held just under my nose and yelled: "You're next!" The girl and I exchanged startled and bewildered looks. Another cop pulled him away. Staying in a pack the police turned and disappeared down the steps. I gave it a minute, and then I followed them. At the foot of the steps a line of ordinary policemen in their tall hats were blocking off the steps down to the Tube; the "state of emergency" lights were flashing above the closed gates and a siren was going full tilt. More armoured riot police were stood just off the kerb with large Alsatian dogs straining and barking frantically at their leashes. A drunk man in smart shirtsleeves and a tie came up and stood just in front of them, smiling stupidly at the dogs. The dogs instantly went mad at this affront, and twenty Officers started screaming at him: "Move! Move! Move!" and "Get back! Get back! Get back!" Eventually he turned as if losing interest and just wandered nonchalantly off into the confused throng of people.